I recently took on a young violin pupil, with an additional challenge: to get her to perform the first violin part of the famous Canon in D by German Baroque composer Johann Pachelbel (1653-1706) for a family wedding later this year. The countdown has well and truly begun! The work is easily recognisable, and is commonly played at weddings, particularly for the grand solemn entrance of the bride. The work is actually titled ‘Canon and Gigue for Three Violins and Basso Continuo in D major, P. 37, but it is the Canon that seems to have survived the test of time. One could be forgiven for thinking of Pachelbel as a ‘one-hit wonder’, as today the Canon in D is all he is remembered for, at least in popular imagination. But he was considered one of the most important composers, organists and teachers in his day, and composed a large body of secular and sacred music. He was teacher to Johann Christoph Bach, elder brother to and teacher of the great Johann Sebastian Bach. (Yes, Johann was certainly a popular name back then!) It is even thought that that Canon and Gigue was written for Johann Christoph Bach’s wedding, although this is speculation. In the Pachelbel canon, the leader (first violin) is followed by the ‘answer’ (second violin) two bars later, and then echoed yet again by the third violin a further two bars later. But from the very outset, the basso continuo (in the Baroque period usually an instrument capable of playing chords, like harpsichord, theorbo, guitar, lute etc; and other instruments in the bass register such as the cello, double-bass, bass viol, bassoon) provides the harmonic structure, and plays the same two-bar line to the end. The eight notes progress from the ‘tonic’ or D, down an interval of a perfect fourth to A; then up a tone to B, and down a perfect fourth again to F#; up a half-step to G and down another perfect fourth to D (the lower octave to the starting note); up again the same fourth to G and a whole step to A; and finally up another perfect fourth to the original D, only to go through the cycle again. The eight chords that accompany these eight notes follow a sequential pattern known as the Romanesca, common in music from that era. The piece is 56 bars long, which means they play the same two bars 28 times, while the violins play their variations over this ground bass. Pachelbel’s Canon skilfully incorporates the polyphonic form (canon) with variations over the ground bass and harmonic progression, known as chaconne. That’s all very well, but it can be the final circle of Dante’s Inferno for the poor basso continuo team. They have been known to pray (even more fervently than the groom!) that the bride arrives to the church on time and doesn’t make them start over! The piece was ‘rediscovered’ only in the twentieth century, and it really entered public consciousness after the Jean-François Paillard chamber orchestra recorded it in 1968. Since then, there has been no looking back for Pachelbel’s Canon, either in its original form, or the countless popular songs it has spawned, from its Romanesca chord progression. There is a very funny video clip on YouTube where stand-up comedian Rob Paravonian has a rant about Pachelbel’s Canon in D, and how its ghost refuses to leave him ever since he played the cello line as a child. He calls the repeated eight-note two-bar ground bass line “the worst cello part in the history of cello parts” and wonders whether Pachelbel once dated a cellist who broke his heart, and this was his “revenge” on all bass instruments. 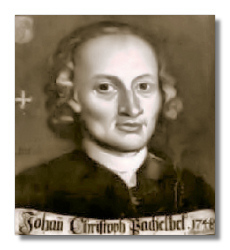 To illustrate how Pachelbel continues to haunt him, he plays the beginning or refrain of so many hits that are all based on the same progression: “Graduation (Friends Forever)” by Vitamin C; “Cryin’” (Aerosmith); “One Tin Soldier” (Coven); “Hook” (Blues Traveller); “Basket Case” (Green Day); “Push” (Matchbox 20); “Good” (Better Than Ezra); “Machinehead” (Bush); “With or Without You” (U2); “Torn” (Natalie Imbruglia); “Sk8r Boi” (Avril Lavigne); “We’re not gonna take it” (Twisted Sister); “On Your Mark, Get Set and Go Now” (theme song from popular 1970s sitcom “Laverne and Shirley”); “No Woman, No Cry” (Bob Marley 1974); “Let it Be” (Beatles 1970). This list spans a gamut from pop, rock, folk, to heavy metal. There must be many, many more ‘spawned’ works like these. British conductor, actor, writer and comedian Rainer Hersch led orchestra and chorus through even more Pachelbel spin-offs in popular music: “Streets of London” (Ralph McTell 1969); “Puff the Magic Dragon” (Lipton and Yarrow 1962); “Down Under” (Men at Work” 1981); “Go West” (Village People 1978); I Should Be So Lucky” (Stock Aitken Waterman 1987); “Don’t Look Back In Anger” (Oasis 1996). He then superimposes several of these tunes over the Pachelbel Canon to create a ‘new’ polyphony, new variations on the theme Pachelbel first wrote sometime between 1680 and 1706. Pachelbel’ Canon in D has been a very good entry point into classical music as it relates so easily to so much music all around us today. Go on, have a listen today. Just don’t blame me if you can’t get it out of your head later. Welcome to Pachelbel hell. Or heaven. Same difference. Always brilliant. Today it went beyond. Thank you.